A woman who lives not far from my own house – let us call her Ibemma (not her real name) – had been married for just five and a half months when her husband died. While going through his possessions after his death, she came across documents which showed that her husband had been HIV positive for a long time and was even taking antiretroviral (ARV) drugs. This came as a complete shock to her as she and her husband had gone together to have an HIV test before getting married. It turned out he had given her the documents which showed that she tested negative while concealing his own. After marriage, he had continued to hide his status from her. According to Ibemma, his parents and other family members also knew his status and helped him in keeping her in the dark. Now after his death, she is in a dilemma. She has got herself tested and she finds that she is now living with HIV. She continues to live at her husband’s house but her husband’s brother has started making unwanted advances – knocking on her door and asking for water in the middle of the night, or going around the house in a semi-undressed. Ibemma does not want to go back to her own house either because she feels that she will become a burden to her brothers, sister-in-laws and her parents as a “returnee” (a married woman who has returned to live at her parental house, something which our society usually looks down upon). After she tested HIV positive she was referred to an organisation working for people with HIV and AIDS, and they referred the case to me. It was only after Ibemma called me that I realised there was someone living so near my house in need of help. The linkages that we had forged with NGOs and other stakeholders helped in establishing this contact between Ibemma and our own organisation. However, although Ibemma is in touch with us, she is still fearful of taking positive action – such as legal or police action against her brother-in-law for sexual harassment or against her husband’s family for helping to conceal her husband’s status from her, thereby exposing her to HIV, or against her husband’s family for her inheritance rights to his property. This is her main concern as she is still living in that house. Ibemma presently works with a local group which makes something called bori – a black lentil, called urad dal, which is ground into a paste and dried into small balls which are used in cooking. She earns Rs 50-70 (61p-86p) per day and with this money she manages her own food and medication. We are trying to get her to meet other women survivors and attend the gender sensitisation programmes that we conduct regularly as we feel that it would give her more confidence and courage. There is much discrimination and violence against women living with HIV. The first step is to contact the right agency for support. However, it also takes courage and support to be able to take positive action to challenge and end the discrimination and violence. This is particularly true for Manipur which has one of the highest concentrations of people living with HIV and AIDS in India. 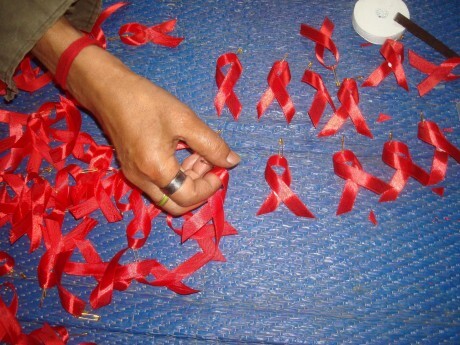 Manipur, with hardly 0.2 per cent of India’s population, has nearly 8 per cent of the country’s total HIV positive cases. Though HIV and AIDS initially started through intravenous drug users in the state, it has now spread to the general population, with women accounting for nearly one quarter of the total HIV positive cases. If the issues of gender equity and violence against women are not addressed, these figures will spiral upwards instead of “Getting to Zero”, the theme of today’s World AIDS Day, which is going to be observed all over the world, including in Manipur. The story serves as an eye opener to espercially married couples that traditionally think they are safe because they count only their partner forgetting the past of their partner before they met and that is were ssometimes like PMTCT one would suggest a mandatory test for couples before getting married to avoid such, it is easier to think am been naughty assuming it is your son daughter brother or daughter in such a situation what would you think anyway lets leave it but continue calling for VCT to all couples whether courting or intending to get married. By the way is society aware that wilful infecting a partner is criminal like in my country Zambia.